I hope you’ve already woken up from your food coma, for those who stuffed themselves silly full of turkey last night! I’m barely able to walk from all the turkey, gravy, mashed potatoes, dessert, etc that I ingested yesterday. ZAGGsparq – on sale for $54.99, but won’t last long! Part of their massive 57% off sale! Energizer Lithium Battery iPhone Case – on sale for $27.99 (previously was on sale for $20.99). A tonne of iPhone accessories are on sale at NewEgg.ca. Click here to check them out. Dell.ca has up to 55% off all Belkin Accessories! Not Your Average iPhone Book – Give Yourself a (Jail)break: This massive 80 page eBook is dedicated to everything you must know before jailbreaking your iPhone. Great for beginners who are late the whole “jailbreaking” game. Well written with lots of visuals! Only $7 still! Read our review here. Don’t forget toÂ download the freeÂ RedFlagDeals.com iPhone app! It now has Push Notifications for deals alerts! These are just a few deals to get your Boxing Day shopping started! Good luck and let us know what finds you come across! 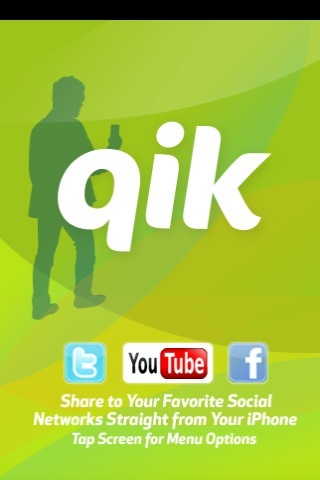 QIK Live for iPhone Now Available!